The Nokia 2630 microphone problem usually caused by damaged mic or broken line in the circuit. When you found the Nokia 2630 mic problem, first step you have to do is check the microphone condition. To do this, you just need the ohm meter. If the mic still good, continue to the second step, check the circuit, is there the broken line? 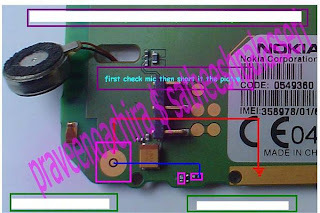 You need the schematic diagram to do this job, but here, we provide the suggestion picture related to Nokia 2630 mic problem.